5300 - The electronic circuit of this unit was developed aiming at a balance between low cost and maximum realism for extra low speed of locomotives. Built-in overload indicador device. 5000 - This is an electronic device development to protect the switch machine coils against overheating from incorrect use. Just one unit is enough for each model railroad and can be connected to any operating system. 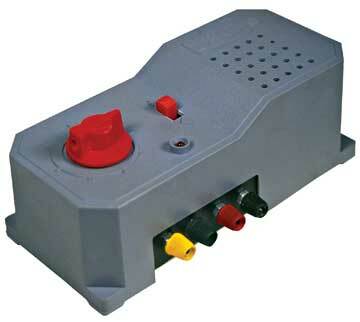 41652 - Turnout control box (4200/4900). 45001 - Turnable control box. 41660 - Single pole switch for track sections insulating. 41661 - Polarity reversing switch (H-H). 41658 - Terminal joiner with red wire (6pcs). 41659 - Terminal joiner with black wire (6pcs). 50030 - Power supply to 5300 control unit. 50031 - Plastic case for 5300 control unit.